Synthetic biology is a growing field that combines engineering and biology to develop or reconstruct biological materials for improved or new uses. It has wide application in agriculture, including the intersection of synthetic biology and chloroplast biotechnology to develop plants with optimized traits. Unfortunately, high costs of bioengineering deter some researchers from engaging in chloroplast biotechnology research. 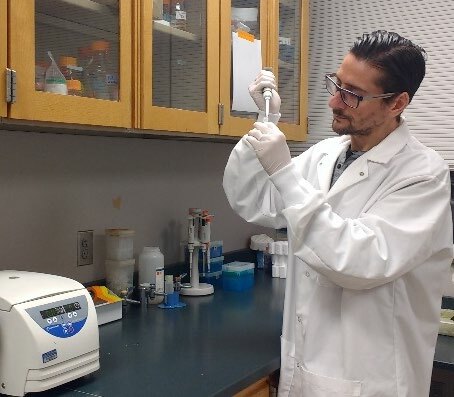 A team of researchers at the University of Tennessee Institute of Agriculture addressed that problem by developing a standardized kit for chloroplast biotechnology that is available for purchase at minimal cost. In an article recently published in Plant Physiology, Scott C. Lenaghan, Assistant Professor in the UTIA Department of Food Science and co-Director of the Center for Agricultural Synthetic Biology, and co-authors Alessandro Occhialini, Postdoctoral Researcher in the Department of Food Science and CASB, Agnieszka A. Piatek, Postdoctoral Researcher in the UTIA Department of Plant Sciences, Alexander C. Pfotenhauer, Graduate Research Assistant in the Department of Food Science and CASB, Taylor P. Frazier, former Postdoctoral Researcher in the Department of Plant Sciences and CASB and current scientist with Elo Life Systems, and C. Neal Stewart, Professor and Ivan Racheff Chair of Excellence in Plant Molecular Genetics in the Department of Plant Sciences and co-Director of CASB, describe the development and validation of MoChlo, their modular chloroplast cloning system kit. MoChlo is an efficient, easy-to-use kit that scientists can use to engineer chloroplasts in plants. It includes 128 standardized chloroplast-specific parts and chloroplast-specific destination vectors. The MoChlo kit will enable small labs with limited resources to enter into the field of chloroplast biotechnology. In addition, the MoChlo kit is a valuable tool for teaching about molecular biology and plant biotechnology, and lends itself for experiential learning. In relation to agriculture, the MoChlo kit can be used to improve crops through metabolic engineering of key traits, including drought resistance, cold tolerance, pest resistance, and even advanced traits, such as nitrogen utilization or improved photosynthesis. By enhancing these key traits, it would be possible for farmers to plant heartier crops with improved yield. MoChlo is available for purchase from the nonprofit plasmid repository Addgene at minimal cost so that researchers with limited financial resources may have access to the tool. Professor Lenaghan and his team recognize the value in researchers having access to standard tools that are not cost-prohibitive. They hope that MoChlo will encourage scientific collaborations, encourage researchers to engage in chloroplast biotechnology, and lead to advancements in the field of plant synthetic biology. “The MoChlo kit seeks to lower the barrier of entry into chloroplast biotechnology by providing a simple toolbox that enables crop improvement to meet the demands of a rapidly increasing population,” said Professor Lenaghan. This work was supported by the Advanced Research Projects Agency-Energy (award no. DE-AR000660), Hatch Project 1012962 and Hatch Project 1016740 from the USDA National Institute of Food and Agriculture, and the Defense Advanced Research Projects Agency (award no. D17AC00016). Occhialini, A., Piatek, A., Pfotenhauer, A.C., Frazier, T.P., Stewart, C.N. and Lenaghan, S., 2019. MoChlo: A versatile modular cloning toolbox for chloroplast biotechnology. Plant physiology, 179, 943-957. doi: 10.1104/pp.18.01220. Read the full article online at http://www.plantphysiol.org/content/179/3/943.